Weather resistant tape is ideal for both indoor & outdoor use. This self adhesive reflective stripe tape provides an extra margin of safety during blackouts, night-time, or low light conditions. Pressure sensitive adhesive tape can be applied to virtually any smooth, clean, dry surface. 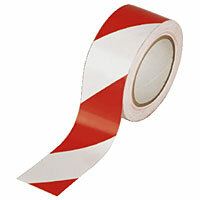 Ideal tape for marking posts, mail boxes, barricades, vehicles, equipment, poles, floors, & more.